A known case of pineal region mass with significant mass effect and obstructive hydrocephalus. Patient underwent Ventricular shunt for obstructive hydrocephalus with biopsy for a pineal region mass. This is a follow up MRI study Brain. 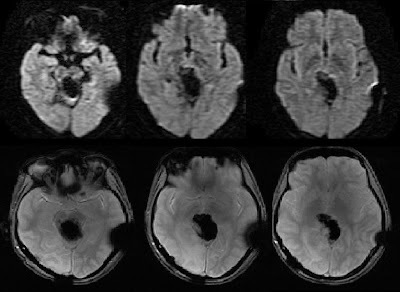 MRI shows an ovoid well demarcated mass in pineal region, low signal intensity on all pulse sequences including T2*GRE implies to dense calcification. On post contrast no enhancement in the substance of mass, a layer of enhancement on the surface of mass is along the dural coverings. Gliosis in left parietal region along the tract of ventricular shunt and right occipital region of attempted biopsy. Description of finding: The resected specimen consist of an irregular, firm, bosselated, tan-white nodule with an attached dura mater on one side. The specimen fixed in buffered 10% formaldehyde and decalcified. Paraffin-embedded sections stained with H n E stain. The tissue consisted primarily of densely packed hyalinized collagen bundles. Major portion virtually acellular, occasional small nests of uniform meningothelial cells. Few areas of whorllike arranged collagen fibers. - 'Psammomatous' variety of Meningioma. Syn: 'Involuted sclerotic' Meningioma, 'Psammomatous' Meningioma. Involuted sclerotic meningioma is a distinct subtype of benign meningioma that lack the classic appearance and manifestation of typical meningothelial meningiomas. A classic meningioma on CT is a relatively hyper attenuating, extra axial mass broad based to Dura with a smooth or lobulated outline that enhances homogeneously on post contrast study. Most common histopathological variety of typical meningioma is fibrous meningioma shows parallel and interlacing bundles of spindle-like cells embedded in a matrix of collagen and reticulin on Histopathology. Whereas a sclerotic meningiomas demonstrate whorl formation around sclerotic vessels, with tumor cells demonstrating glial fibrillary acidic protein expression. In the sclerotic variety due to dense calcification these masses are iso dense to bony calvarium on CT, contrast enhanced studies are non contributory as enhancement if any is difficult to interpret in the back ground of dense calcification. 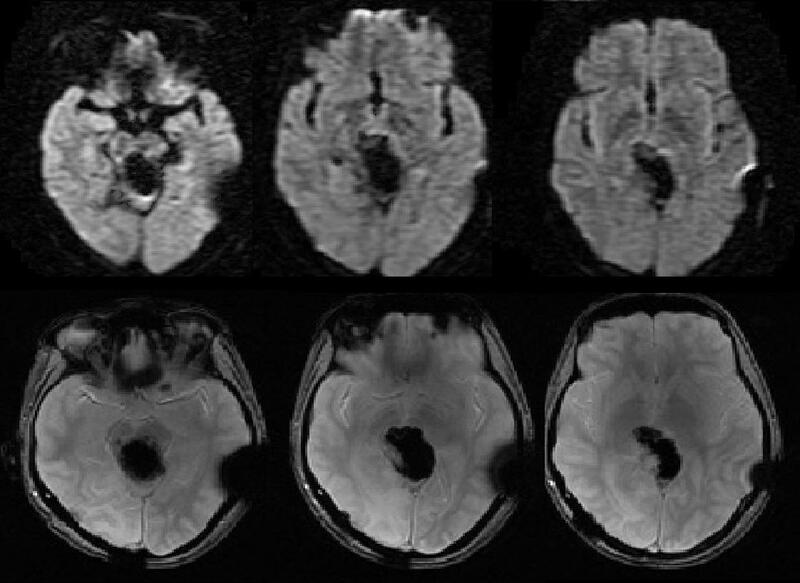 On MRI, lesion is low signal intensity on all pulse sequences, poor or partial enhancement on post contrast. Dural tailing on post contrast and focal hyperostosis of adjacent bony calvarium of a typical meningioma are absent. Differential diagnosis for an extra axial calcified mass at the cerebral convexity without dural tailing or bone reaction should include osteoma.